DeeZeePete will play at the June 24th fundraiser for our CE Academy and the foundation to support children with disabilities on their quest to be more functional. Please pass this along to any Gainesville bands interested in doing something for charity, spreading the word and reaching more kids. We are a small town charity and a small town program. We don't get the exposure or the big money national foundations have. But the Gators have always been very supportive and one thing I have to say for Gainesville is that the community has always been vibrant and we have considered ourselves part of it. The University-town nature of our city complicates things a little bit. There's a lot of young people want to get involved in meaningful causes. On the other hand, the Gator-crowd and the Gainesville locals seem to two be different worlds. It's not difficult to understand, Gainesville is a transient town. Students have their own goals, their own passions and they will not be here too long, why should they get too excited to help parents that are from here? I was recently asked to help start a local cultural foundation for young musicans and I have no doubt UF students will stand behind it because they understand it more. Also, the nature of our cause doesn't help. Conductive Education isn't something that everybody understands without a long explanation and the name is not very intuitive. It's a bridge difficult to cross, but when we do, magic happens. We have an energetic UF student group called "Gators for Conductive Education". Local musicians, once they understand how we help cerebral palsy children help us put on concerts, artists and designers support us with their craft. 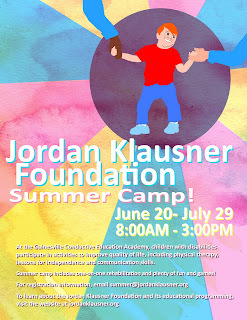 Just recently, UF alum and exibit artist David Tarafa designed a wonderful poster to promote our Summer Camp. And we are very grateful. We are part of this community and whenever it hurts, we hurt. That's why we are so concerned for the future of this city. Many businesses have closed with rumours of many more following. We saw Ben and Jerrys, Hooters, Mellow Mushroom, American Apparel, Ti Amo closed down for good. Bars and pubs in this town are not only places where the Gators get intoxicated, but also cultural hubs where bands, comedians and painters have shows and practice their crafts. Common Grounds is closing in June after 8 years, Fyre/Shooting Star, Rum Runners/Fat Tuesday had closed down and Brophy's Irish Pub, 706 and Midnight are reportedly up for sale. The youth, the music, the art are the life of this town. Gainesville gave the world such acts as Tom Petty and Sister Hazel, it's where Grooveshark is headquartered. We depend on local residents and businesses and can't help wondering how this crisis will affect us all. But for now, join us, help us, support us.